Q. What does it mean when my "check engine light" or "service engine light" comes on? There are many reasons for this light to come on. Your vehicle has many sensors and computerized components that manage your vehicle’s engine performance and emissions. When one of these fails, the "check engine" light will come on. Although your car may seem to run fine, it is important to have the issue addressed to prevent needing significant car repair. 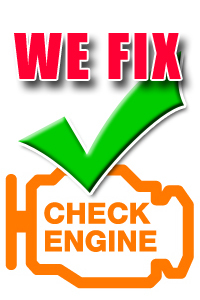 In Ohio if your check engine light is on you will automatically fail your E-Check. We are an authorized E-Check repair facility. Q. Can I drive my car if it starts to overheat? We recommend not to drive your vehicle if it is over heating. This is a very serious problem. If your car overheats for too long, you can create extensive damage to your engine, causing increased car repairs. As soon as possible, find a safe place to pull off the road and shut the engine off. Do not attempt to check the fluid level in the radiator; the hot fluid can cause severe burns. The best thing to do is have your vehicle towed to DAS Auto Service. Q. Is it really that important that I have my cars oil changed as often as the manual recommends? YES, one of the most critical maintenance chores for cars is changing the oil regularly. Each manufacturer states how often the oil should be changed for each of it's vehicles. 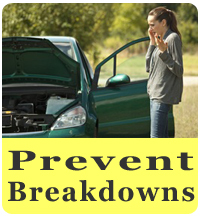 Neglecting to follow these simple recommendations can cause expensive repairs down the road. At DAS Auto Service we not only change your oil with a high quality grade, we also inspect your vehicle for leaks. An oil change is usually inexpensive and quick. Having it done makes good sense and helps prevent damage to your engine. Q. How Often Should My Car Receive a Tune-up? Most cars require regularly scheduled tune ups yearly and require major maintenance such as a timing belt replacement at 60,000 miles. You can refer to your owners manual or call DAS Auto Service for any questions you may have about your vehicles maintenance. Q. My engine “cranks or turns” but it does not start or stay running. Why? If your engine is turning but does not actually start then it could be a number of problems such as, the engine is not receiving sufficient spark from the spark plugs, fuel from the fuel pump, compression from the pistons and piston rings, the timing belt could be defective or has slipped, or one of the onboard computer controls needs replaced. These circumstance requires a thorough engine and computer diagnosis to pin point the problem and derive a recommended solution. We has all the necessary tools and expertice to handle these type of automotive problems.